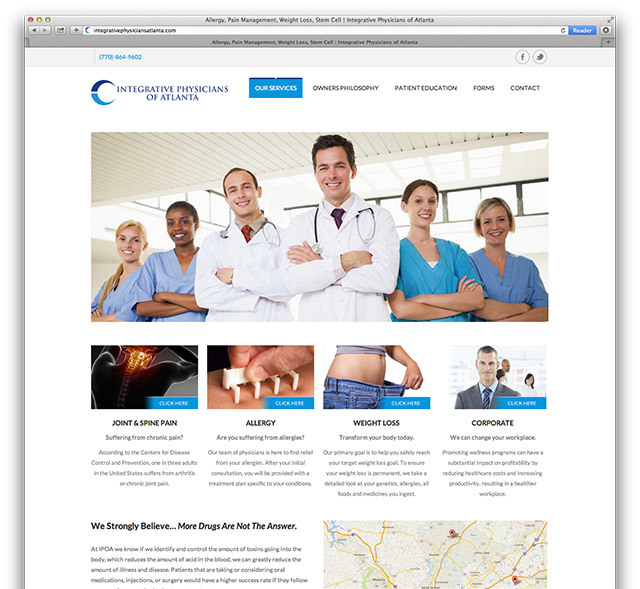 A longtime client referred Dr. Dana Piccirillo to us for help with his website and to grow his Medical practice. Admittedly, his mission to introduce a revolutionary approach to health and medicine is what caught our attention. So first he tests patients for food, medical, and environmental allergies. This was the first nugget we needed – as his patients would be looking for an allergist in Atlanta. Knowing this information gave us a solid starting point to build a strategy around. We began researching allergy testing, but continued learning more about his unique approach. Next we discovered as a result of removing certain foods and controlling toxins entering the body, his patients would greatly limit disease and lose weight, which was the second key takeaway. He went further and explained how new DNA and Genetics testing helped him have a complete picture of his patients makeup and medical background. From there he then knows the best treatments and solutions to prescribe to get his patients well, without relying on drugs. There’s more, but allergy and weight loss had a large enough demand in Atlanta for us to focus here initially. So we redesigned the website, tweaked his old content, and added new optimized pages. Patients struggling with allergy and weight gain symptoms began finding Integrative Physicians of Atlanta easily. Now More patients are finding his practice, and he’s able to help more people live healthier lives. See the redesigned website below and visit Integrative Physicians of Atlanta to learn more about his revolutionary approach to medicine. Send us a message at info@webconsultingandmarketing.com or call us at 404-926-6650 to schedule your free Marketing consultation.